Bruce serves the function Alfred once did, remaining in the Bat Cave to mastermind strategy by remote control. I’m surprised it took him as long as it did to figure things out. He genuinely is slipping in his old age. Bruce’s role on the team comes to forefront in a conversation with former Creeper Jack Ryder. In fact, Ryder is as much a hero here as anyone – but don’t expect to see him donning his green wig and yellow tights any time soon. Despite the original Batman’s status in the DC Universe, it’s refreshing to see another character who isn’t entirely sold on the legend of the Dark Knight. One might argue Batman is, as another detective described himself, “a high-functioning sociopath.” No doubt Batman has left a trail of human wreckage in his wake, but it was all in the name of justice. That makes it okay, right? This has been a standard five-issue story arc, which n my youth, was an epic adventure. But these days it’s standard, perfect for re-packaging in TPB form. I’m growing more comfortable with the format, so long as the creative team remains in place throughout the entire story. It’s when each chapter is drawn by a different artist that I feel the narrative becomes visually disjointed. 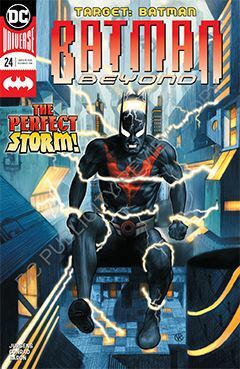 Thankfully, Batman Beyond is pretty consistent, and it’s become a personal favorite because of that.